Sheets up to 13" x 27.5"
The Atlas-TRIO15 is a revolutionary solution for digital print finishing, allowing users to slit, cut, crease and even fold in a single pass. It's ideal for high-speed creasing and production of a wide range of jobs including business cards, postcards, brochures, booklet covers, greeting cards and more. 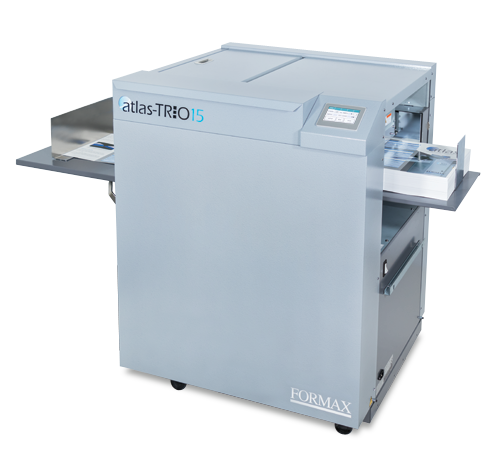 The Atlas-TRIO15 uses an upper-belt tri-suction feeding system, and a feed table which automatically elevates, giving it the ability to process sheets up to 13" W x 27.5" L, in weights from 120-350gsm. The 4" touchscreen control panel provides three modes for various job requirements: Preset, for the most common formats and sizes, Manual, which modifies the preset jobs, and Flex mode for the greatest customization. It also stores up to 150 custom jobs, for quick and easy recall. 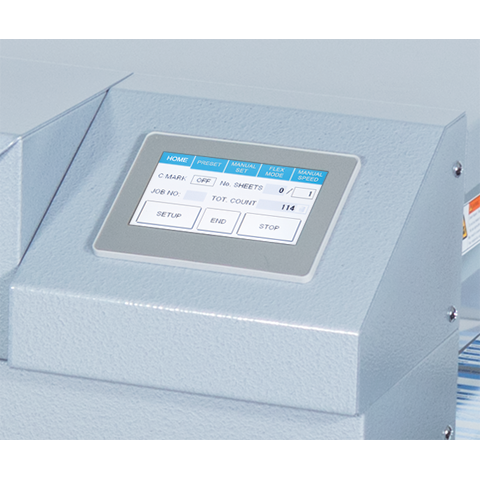 Production speeds vary based on media size and finished output: up to 250 business cards in under 2 minutes, single-crease jobs up to 5,000/hour. 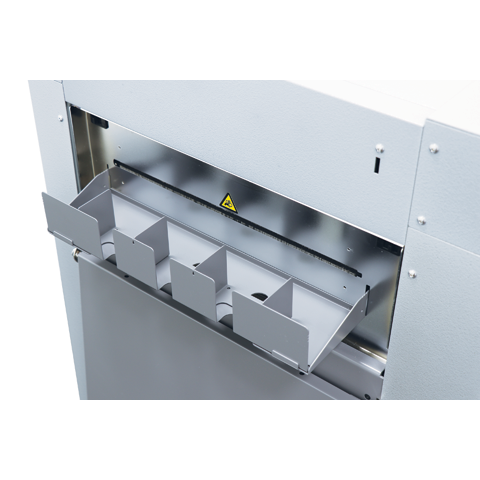 Standard features include double-feed detection, cut-mark registration, side alignment guide, skew adjustment and two standard slitting guides. Custom slitting guides are also available. To make an even bigger impression with the printed page, the Atlas-TRIO15 can be combined with the optional AC-10 Folder which will easily transform large sheets into finished pieces. 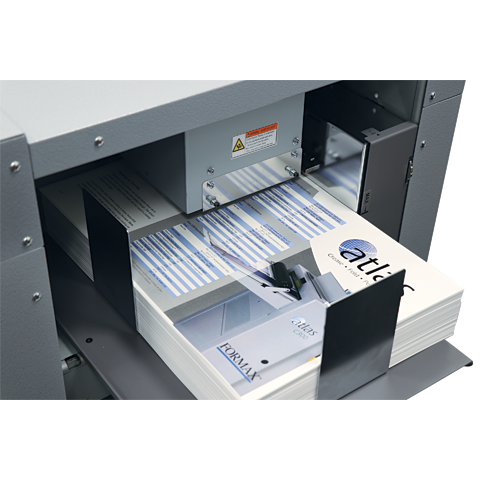 This powerful combination enables user to cut the lead and trailing edges, bleed trim the top and bottom, crease and fold, for stunning professional output. 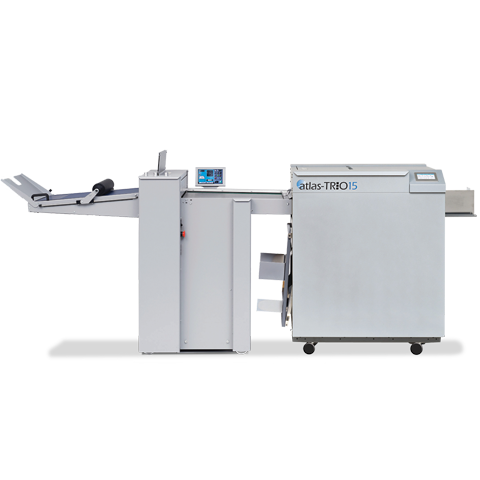 High-speed output, user friendly controls and the ability to handle large media sizes make the Atlas-TRIO15 a great complement to today's digital print environments.